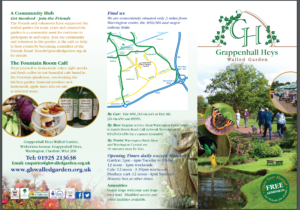 See the home page for current garden and cafe opening times. Outside these times it may be possible to organise group visits by booking in advance. Entrance is free, and free parking is available nearby. There are WC facilities available on site and the cafe is open on Fridays, Saturdays and Sundays. 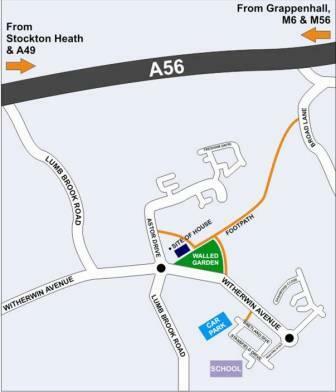 Public Transport to the Garden – The no.8 or 9 bus service from Warrington Bus Station (the interchange) stops near the garden, close to the roundabout on Lumb Brook Road. The bus leaves at a quarter past every hour from Bay 8 (as at 15.09.11). For further details of times contact Warrington Borough Transport Customer Helpline on 01925 634296 or visit www.warringtonboroughtransport.co.uk. Disabled Visitors – There is a hard-surfaced route which goes from the main gate right through the garden and is suitable for wheelchairs. Other paths off this one are gravel and grass, and are therefore less suitable. We now have WC facilities suitable for the disabled. The Pleasure Grounds contain three deep ponds which can be dangerous, especially to children. Keep children and animals under control at all times, dogs should be kept on a lead and are not allowed in the cafe area. Follow the instructions shown on notices at each entrance and any guidance given by the Visitor Warden or other staff. The Garden is on Witherwin Avenue, close to the roundabout where it meets Lumb Brook Road. 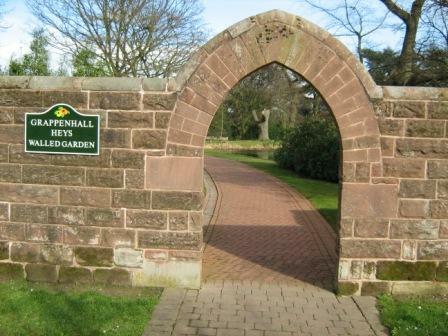 The garden entrance is about 100m to the right of the Grappenhall Heys gates, which are just off the roundabout. The best approach from further afield is to leave the M6 at Junction 20 or the M56 at Junction 10 and follow the B5356 to Appleton Thorn. Follow the road into the village centre and look for the Church. (By the Church don’t miss the Thorn Bush, which gives the village its name and is decorated each year by villagers). By the Church/Thorn Inn, turn onto Lumb Brook Road and follow it to the roundabout at Witherwin Avenue. If you arrive by car, the best place to leave it is in the car park off Stansfield Drive, beyond the School. From the car park, walk past the play area and across Witherwin Avenue – be careful of fast-moving vehicles. If you visit at times when the School is open, please watch out for pedestrians and be considerate to School traffic. 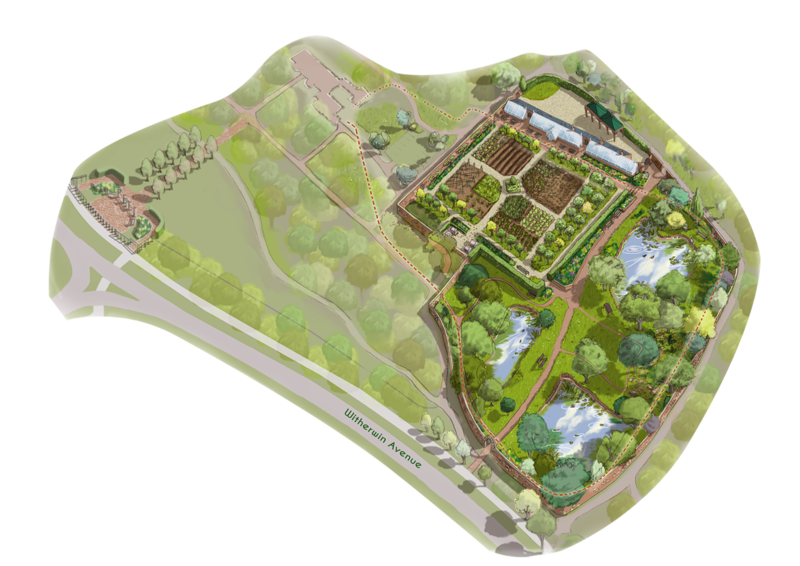 Alternatively, the Garden can be approached on foot from Grappenhall Village, using the footpath which leaves Broad Lane at the Cricket Club, by the former lodge. 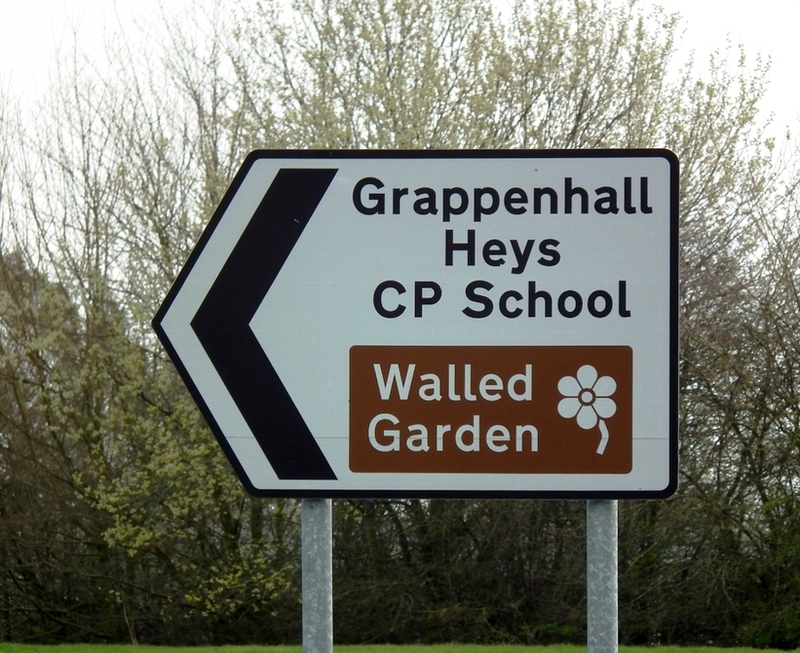 If you have time, take a few minutes to explore the site of Grappenhall Heys House, which can be found through the entrance gates to Grappenhall Heys next to the roundabout. The house has long been demolished but the grass area and stone blocks mark its site, and the old ‘ha-ha’ in front of the house is crossed by the footbridge from the roundabout. A little further afield there are a number of estate buildings including two farms, Dairy Farm on Lumb Brook Road and Witherwin Farm on Witherwin Avenue. The two lodges designed in a neo-classical style also remain. They stood on opposite sides of the park, at the entrances. One is on Broad Lane near Grappenhall Cricket Club and the other is near Witherwin Farm. A public footpath runs west from the Cricket Club on Broad Lane, round the outside of the Garden and across Witherwin Avenue to beside Dairy Farm. You can re-trace the steps of the Parrs around their estate by walking this path.